Content by Tony Macklin. Originally published on December 12, 2016 @ tonymacklin.net. La La Land is a musical without grace. It could be called La La Lard. Those looking for "show-stopping" scenes should look elsewhere. The film's opening sequence should warn us. It's a traffic jam on a Los Angeles freeway. Suddenly the occupants of the stopped cars leap out and start singing and dancing. That's feasible for a musical. But they're awkward. There's no grace in the scene. It's a jumble. It sets a tone. Grace is not going to be an important factor of this film. Neither is talent. What is? La La Land is a musical about striving. The main strivers are two wannabes - Mia (Emma Stone) and Sebastian (Ryan Gosling) - who have come to LA seeking success. Stone and Gosling have been cast because they have no more than moderate skills singing and dancing. They're fine actors who have found themselves in a film in which their talents are not primary. Mia and Sebastian first make contact on the freeway, then in a bar in which Sebastian has just been fired, and then at a party. Love begins to simmer. But they have different career objectives. Sebastian is a musician, a jazz purist who wants to own a club that honors jazz. Mia wants to be an actress. She constantly goes to failed auditions and works as a barista on the Warner Bros lot where she sells pastry with gluten. La La Land has a lot of gluten. She writes her own one-woman play, which fails but she is discovered. At the height of their success he wears a mean hat and she is on a poster. Ah, easy success. But what of their future together? A penultimate moment near the end of the film has dazzle and shock, but its just a moment. It has random wish fulfillment. The gush of acclaim for La La Land may be because it has three universal themes that we all can share. First is the theme of making the choice between career and love. Which one is primary and wins out in our decisions? Second is the idea that if we had chosen differently we all could have been more successful. The third, and perhaps dominate reason, is the film's promotion of the idea that you don't have to have real talent to succeed. That's a popular concept. Esteemed critic Pauline Kael once said, "It's a musical for people who don't like musicals." 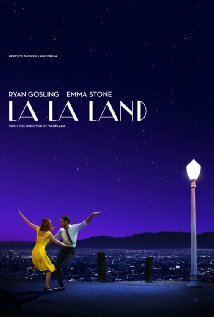 To paraphrase Kael, La La Land is a musical for those who don't care whether singers can sing and dancers can dance. It's a musical for "dreamers." It's a musical for those whose dreams are over. "Follow your dream" is a modern cliché. Advertising is full of it. Follow your dream - no matter how vacant or pedestrian it may be. Dreaming has lost its grace and meaning. I wonder about all the brilliantly talented people who have come to Los Angeles and sit and watch this movie. Are they frustrated that their skills and lifelong labor on them have been usurped. Or do they think "that could be me"? La La Land is a film for 2016. Grace is gone from this musical, as civility is gone from our culture. We live in a society now in which saying you're great makes it so. But grate is not great. On one level La La Land could be seen as a political allegory. The talented John Legend, the leader of the band, could be Obama. Sebastian and Mia could be two other political wannabes. Two of the films that will be nominated for Best Picture Oscars for this year are Manchester by the Sea and La La Land. They already have won several awards as Best Picture of the Year. In both the characters settle. They don't grow much, they accept their lot. There's no resolution, there's bittersweet conclusion. Ryan Gosling and Emma Stone are channeling their Richard Beymer and Natalie Wood. And once, I thought it was Woody Allen and Diane Keaton dancing. John Legend brings musical creativity to La La Land. Director/writer Damien Chazelle knows his musicals of the past. He makes allusions to Singin' in the Rain (1952), The Band Wagon (1953), Funny Face (1957), The Umbrellas of Cherbourg (1964), The Young Girls of Rochefort (1967), and more. He even tosses in Rebel Without a Cause (1955). What is the reason for the tumult of praise for La La Land? People applaud like it's not just chopped delivery.